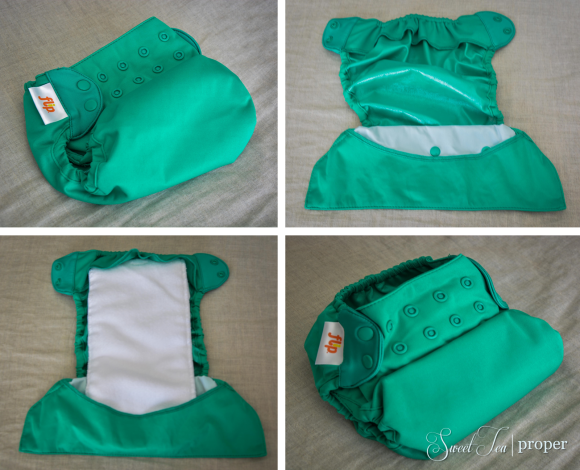 A few months ago we discussed the ins and outs of cloth diapering including the many different styles (all-in-one, all-in-two, hybrid, pocket, prefolds, etc). 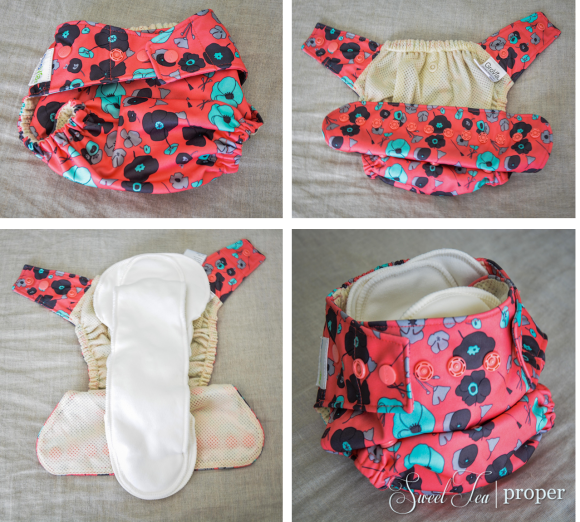 Being new to cloth diapering, it can all seem a bit confusing, but have no fear. Once you get started, you will find that it is easier than you think and honestly, it really isn’t that much work. This review is strictly our experience with GroVia hybrid diapers with cloth inserts, Flip hybrid diapers with cloth inserts, and gDiapers with disposable inserts. As with anything baby related, what ends up as the best option for your family is the one that works best for you and your baby. Before we get into the pros and cons of each cloth diaper, let’s talk about the different options available with each diapering system. The GroVia cloth diapers are a two-part system that incorporates a waterproof shell and either a cloth or disposable insert. There are two choices for the one-size shell – either snap or hook and loop. Both diaper shells use snaps to adjust the size of the shell. The difference lies with securing the diaper around the waist. The snap option uses the same kind of snaps that is used for adjusting the size. To make the waist section larger or smaller, you simply pull in or let out the snaps. The hook and loop option uses a Velcro tab to adjust the waist. Since the diapers will experience frequent washing, it made more sense to us to get the snaps over the hook and loop. However, I can see how the hook and loop option could make diaper changing faster as well as closer to the feel of using disposables (which can be a pro for some). The liners are a thin material similar to a dryer sheet. It allows the liquid to pass through while creating a barrier for the solids. In theory, this should make cloth diapering easier and a lot less messy. While we did purchase some, we have yet to see these in action. 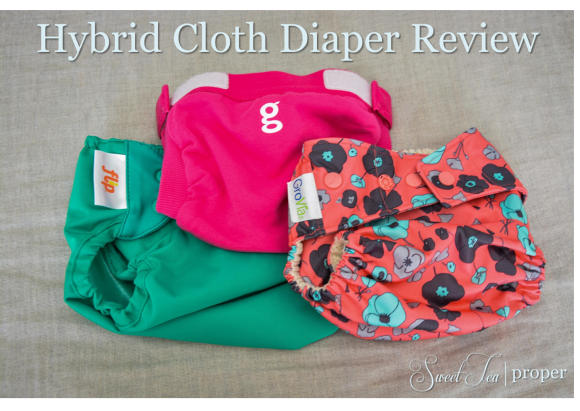 The GroVia hybrid cloth diapering system is one of the best reviewed and we can see why. The one-size style means that you only have to purchase the diapers once and you’re done. This makes it significantly cheaper than individually sized cloth diapers. Each shell has a mesh lining and snaps inside to secure the cloth insert. The lining makes the diapers feel more durable, but it also increases the weight and bulk of the diaper. The snap-in option for the cloth inserts keeps the insert in place as your little one moves around. This means less leaks because the insert stays in place. For our trial of the Grovia Hybrid Diaper we used a one-sized snap diaper with the GroVia Organic Soaker Pads. The Flip hybrid diapers are also a two-piece diaper system. The diapers consist of a waterproof shell with a place to add a cloth or disposable insert. Unlike the GroVia diapers, the waterproof shell/cover does not include any additional lining. This makes the cover feel less durable than the GroVia cover, but it also makes the overall diaper lighter and less bulky. It is also less expensive. There are three different insert options available – Flip Organic, Flip Stay Dry, and Flip Disposable Inserts. The Flip Organic cloth inserts are made of 100% organic cotton and come in a daytime and nighttime version. The Stay Dry inserts are composed of three layers of microfiber cloth. Each cloth insert has a marking for small, medium, and large. For the proper size, you fold under to the appropriate size line then tuck the ends under the flaps inside the diaper. There is a flap on the top and bottom in the inside of the diaper. The Flip diapers do not have a snap or other feature to keep the insert in place. For our trial, we used a waterproof shell with a Stay Dry insert. 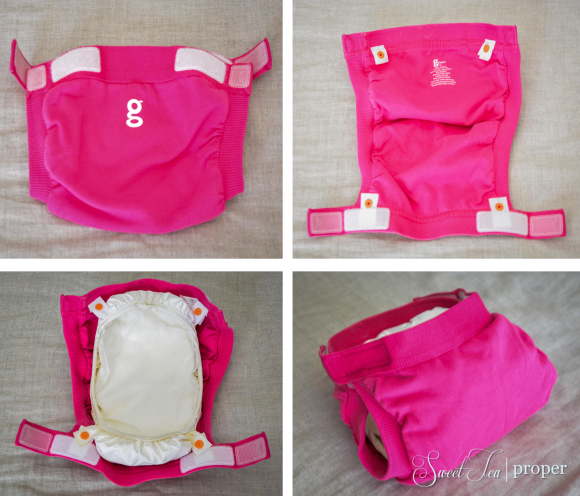 If you are on the fence about cloth diapering, check out gDiapers. It was this brand that really made me believe that cloth diapering might become a possibility for our family. With both cloth inserts and biodegradable liners that you can (supposedly) flush or compost (wet only), these cute little diapers are great for the trendy mom and dad who are also concerned for the environment. The gDiapering system consists of three parts: a cloth shell (called gPants), a waterproof liner that snaps into the gPants (called a gLiner), and either a cloth or disposable insert. The gPants come in Newborn, Small, Medium, Large, and Extra Large. There is only one closing option and that is the hook and loop (Velcro). The gDiapers are also different from the other two because the gPants are secured in the back. With a variety of colors and styles as well as a trim fit, these are adorable cloth diapers (hard to believe diapers can be cute!). The cloth inserts are made of two layers of hemp/cotton and two layers of microfleece. For our trial, we only used the disposable inserts. Which cloth diaper is better? GroVia has a few cute prints and plenty of solid cover shells to choose from, but these diapers are definitely the bulkiest of the three. The Flip diapers have a comparable color and print selection to the GroVia diapers, but a much trimmer fit. The gDiapers have the greatest selection and best fit. Although the GroVia and Flip diapers are considered one-size diapers, the individual sizes of the gDiaper make it the slimmest option. Unfortunately, all of the diapers left red marks on my baby’s legs and stomach. While disposable diapers do also, it’s not as noticeable as the cloth diapers. Cecilia was around 12 pounds when we performed the trial so she was on the smaller side for the diapers. Of the three hybrid diapers, GroVia is the only brand that didn’t give me any leaks. Both gDiapers with the disposable inserts and Flip with the cloth inserts leaked at least once. While the disposable inserts are convenient, I found that they had to be changed at a maximum of every two hours. This was not always possible and then we’d end up having to change her entire outfit when we got home. We had to really tighten the Flip diaper cover to keep the diaper from leaking (which meant more red marks on her legs and stomach). Now that Cecilia is bigger, we have had better luck with the Flip inserts than we had during our initial trial. If you’re struggling with leaks, there are two main issues that may need to be addressed. First, did you prep the covers and inserts? Second, is the diaper put on correctly? The cover should fit snugly and the cloth insert shouldn’t be visible. If part of the insert protrudes out of the sides of the diaper, simply tuck it back in. Poop. Yep, the one thing that really makes people squirm when they think about cloth diapering. Whether a disposable or cloth diaper, no one enjoys changing a poopy diaper. It’s gross. However, as a parent you don’t really have an option, so hold your breath and try not to get it on your hands. We have had the worst luck with disposable diapers and blowouts. We have used both Huggies and Pampers Swaddlers (which is still my preferred nighttime diaper) and neither have been able to contain large amounts of poop. Although we have had more leaks with cloth diapers, we have had much better luck containing blowouts. We have experienced our share of messy diapers and not one blowout with any of the three brands during the trial. Update: Since the trial, we have had one blowout only which is significantly less than the amount we were having with the disposable diapers. I would not recommend the biodegradable disposable inserts if you think there’s a possibility of a poopy diaper. Unless it’s minimal, things could get ugly! Another reason why many parents stray from cloth diapering is the extra laundry. I’ll admit, you will have an extra two to three loads per week. However, with only minimal folding needed, it’s not as time-consuming as you might think. *STP Tip – Make sure to use the correct detergent when washing cloth diapers or you might struggle with buildup. The Flip diapers are the easiest to launder of the three brands. After the diapers are prepped, you simply wash the diapers on hot, give them an extra rinse, hang or lay the covers flat to dry, and dry the inserts in the dryer. The covers are dry within a couple of hours and usually the inserts are dry between 60 and 90 minutes. Now, it says in the packaging that it’s recommended to wash the inserts and covers separately. I wash the covers and inserts together and so far I haven’t had any issues. When washing the GroVia diapers, (again) I washed both the cover and insert together. As with the Flip diapers, I hung the cover to dry and placed the cloth insert in the dryer. Both the cover and insert had a longer drying time compared to the Flip diapers. Since the gDiapers have a cloth shell (gPants) and waterproof liner, it is the liner that has to be hung dry and the gPants go in the dryer. The waist and leg holes are made of a double layer of fabric which takes longer to dry. You have to make sure to close the hook and loops before washing or the Velcro can pull on other pieces of fabric. This is just another tedious thing to have to remember to do before washing. For full-time cloth diapering I would recommend having enough cloth diapers for 2 – 3 days. These prices are the standard cost before taxes and shipping. *STP Tip: I waited (and waited!) for the best sale and Black Friday weekend appears to be the best time to buy cloth diapers. *STP Tip: We outgrew the Small gPants pretty quickly. If you’re willing to wait until your little one gets a little bigger, you can wait and only purchase the medium and large as needed. If you decide to only purchase one size at a time, make sure to purchase a few extra liners. With any of these brands, there are also several bundle packages where you can save money. The prices above reflect the manufacturer’s price for individual sales. This was a really hard decision, but I’m so glad we took the time to try out the different brands. Prior to the trial, I had decided that we were going to use BumGenius All-in-One Freetime cloth diapers. However, after purchasing one, I knew that they were just way too thick and heavy for us. Based on reviews and price, I then decided that we were going to use the GroVia hybrid diapers. After the trial, although these were the best for leakage, Mr. P really didn’t like the additional thickness. Now, we were down to the two remaining brands. I loved the way the gDiapers fit our baby, but the price was just too high. We decided to give the Flip diapers a try and so far we love them (or at least I do!). Catching a great sale on Black Friday weekend, these were the perfect combination of affordability and functionality!